General. Bergen is the largest city in Norway after Oslo. 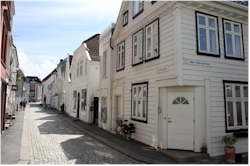 It is mainly known for a row of historic wooden houses alongside the quay: Bryggen, also called the "wharf", which reminds you of the time that Bergen was an important hansa town. This part of the town is recognized as cultural heritage by Unesco. Bergen is located close by the sea. 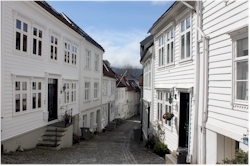 Due to the gulf stream and the seven surrounding mountains, Bergen has much milder climate than other parts of Norway: milder winters and softer summers. This also has a disadvantage: it rains more than half of the days. As a result Bergen is sometimes called the city of rain. However, when the wheather is nice, there's a convivial bustle in the old harbor. If you like fish, then you should certainly pass by the fish market, which is partially covered. Here you can also taste the fresh catch in one of the restaurants. 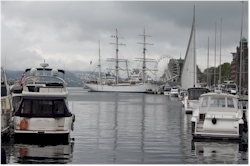 Bergen is one of the highlights of every tour through Norway and a regular stop-over for many cruise ships. TIP: If possible, foresee some room in your planning to shift indoor and outdoor activities. Don't let a nice sightseeing walk in the town litterally fall in the water due to the high possibility of rain in Bergen. There are plenty of things to see and to do in the town that do not require good wheather. An umbrella might come in handy. History in short. 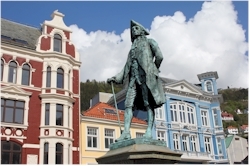 Bergen was founded as a trade settlement in the 11th century. 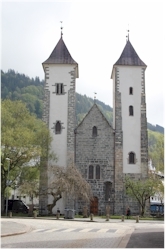 This settlement expanded to such extend that the town became the capital of Norway in the 13th century and that until the 14th century when Oslo took over that role. Bergen acquired a very important privilege in the 13th century from king Håkon Håkonsson: all trade north of the town had to happen via Bergen. Fish was an important commodity and especially stockfish (such as dried cod) because it remained edible for much longer. The period of highest prosperity started in the 14th century when the settlement became member of the German Hanze. The influence of the German traders should not be underestimated; it was so extensive that they settled in their own quarter (Bryggen) and that German was the main language. This continued until the middle of the 18th century when the Hanze closed its office in the town. Throughout its existence, Bergen had to endure several great fires that each time burnt down large parts of the town. Traditionally houses in Norway were built in wood making them more vulnerable to fire. A small fire could rapidly turn into a catastophe with dramatic consequences. 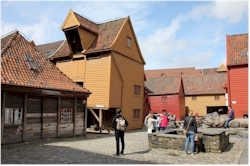 Also the historical quarter Bryggen did not escape but was each time rebuilt according to the original ground plan. Even today people are wary since there are still a lot of wooden buildings in several parts of the town. They may be iconic and look very beautiful but history learned that construction in wood does involve risks. Bergen is a fairly big town so getting there is no issue the whole year around, not even by car. Just outside the town there is an airport with also a few international connections. There are several connections by ferry and boat with other towns. The train from Oslo to Bergen is a specific experience and has the reputation of being one of the most beautiful train journeys in Europe. On the voyage you pass through breathtaking panoramic landscape: mountains, lakes, valleys, rivers, forests and fjords. One of the most impressive passages is the one over the Hardangervidda plateau (nationaal park). On the route you also pass by the highest train station of the country, being that of Finse. - Ferry: www.hurtigruten.com, www.skyss.no, www.rodne.no, www.norled.no of www.fjordline.com depending on the destination.